Hi, I'm brand new to the group. I've cooked all me life and I've avoid most store bought bread due the stuff in them. I'm looking forward to making healthy natural bread, the way it was intended to be made plus all the other recipes. I just bought your book in Leavenworth a week ago while spending the weekend snowshoeing in deep snow. Most of my equipment should be arriving next week. Hopefully you'll be hearing rave reviews soon. Hi Ralph and welcome. Leavenworth is a cute little town, though it's been a long time since I was there last, so it's probably changed a ton. I'm happy to hear that you found the book while there. I look forward to hearing how the process works for you, and your (hopefully) rave reviews! Hi! I'm new to the group. 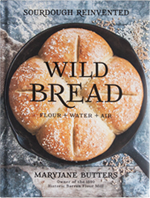 I discovered Mary Jane's book "Wild Bread" yesterday. I love cookbooks and this one has held me captive since I saw it, purchased, opened it up to read. I love to cook; my baking skills I am honing. Efforts making bread have been hit or miss over the years. My desire is to prepare as much food as I can from scratch. Lately sourdough, fermenting have been on my "to-do" list. This is a great start. I split my time between Big Sky, MT and Milwaukee, WI. Ironically bread my bread baking in the Mountains has been successful! I'm excited to learn from everyone and, hopefully, contribute my successful efforts! Hi Jacquie, and welcome! I'm looking forward to hearing more from you! 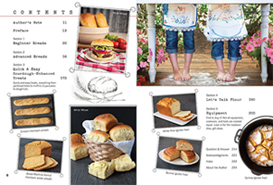 There is much satisfaction to be gained from making foods from scratch, and, I have to admit that the satisfaction and feeling of accomplishment gleaned from making lofty breads from simply cultivating a mother using just flour and water is a huge draw for me. I hope you enjoy the process as well! Hi Jan and welcome! It's wonderful to hear that you've been enjoying Wild Bread! Also, long-arm quilting! I think that is such an awesome skill to have. So much patience, technique, and skill goes into that--I wouldn't even know where to start. All of the quilt I make are finishes with simple diagonal lines or grids. I LOVE this Wild Bread book. This will be all new to me and I can't wait. Started my counter mother this morning. I would love to have my second mother start from home milled grain. Lot's to learn before I get there. First ever online forum joined. Us 50+ folks don't come by this easily. I think the help and fellowship of bakers will be a joy! Welcome to the chatroom! Which type of flour are you using for the mother you just started? I started with Mary Jane's white special flour. I figured to start with something I knew would be most successful and learn the ropes. The pictures of the Kamut and Einkorn sure do look delicious, so one of those will be the next try. White flour is a great flour to start on. I just popped two loaves of white-flour batter bread in the oven, with two more loaves rising in the proofer. Even though I have loads of pictures of loaves just like them, I couldn't help myself, and snapped a picture just before putting them in the oven. My bread just came out of the oven with an impressive amount of oven spring. so I thought I'd share.